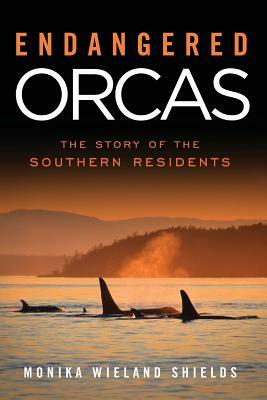 We had to go down to Seattle for a night, but on the way I took an hour to stop and bird a little bit in Skagit County. I was really hoping to turn up some greater white-fronted geese, a year bird that has somehow eluded me (it doesn't help that most of them pass right over San Juan Island without stopping!). Alas, it wasn't to be. Aside from lots of red-tailed hawks, a couple of great blue herons, and a single kestrel, it proved hard to turn up any birds at all. 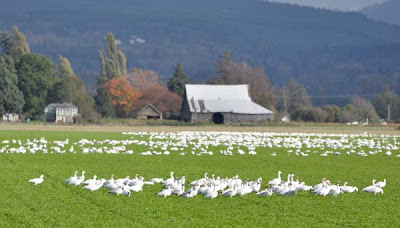 Finally, just before it was time to leave, I spotted a big flock of several thousand snow geese in a field. I scanned the lot of them and turned up a small group of Canada geese in the middle, but couldn't find any greater white-fronteds or any of the smaller white Ross' geese, which would also be a year a bird. I should still hopefully be able to turn up both species before December as they're coming back in greater numbers now! 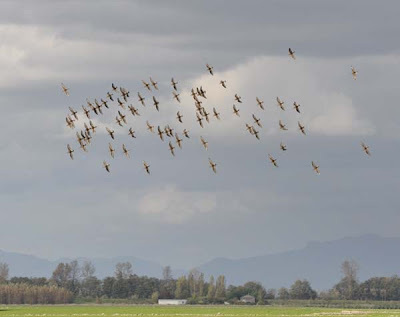 ....and right on the other side of the road a flock of sandpipers took flight. I'm not 100% sure, but I think they were dunlin - my first of the autumn. I expected the weather to turn yesterday as forecast, but it stayed fairly nice right through to this morning. Now we've all battened down for the first major storm of the season. The wind is howling outside now. It's blowing about 15 mph, gusting up to 25 mph, and supposed to get up to gusts of 40 mph tonight! Yikes! Goodbye, Indian summer. Great images once again. Such beautiful birds. Gusts of 40mph - pah we laugh in the face of breezes like that!!! 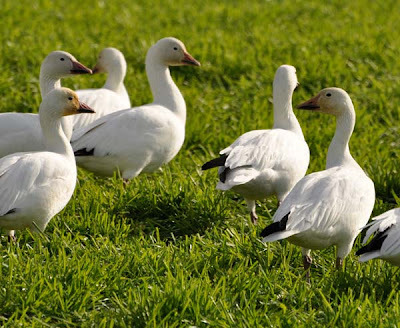 Nice goose pics, how tame are they wecan't get within 1/2 a mile of ours even using a vehicle as a hide. Hoping for a white-front in with our pink feet soon too. Dave - It's a little different if you're literally living ON the water! I suspect we'll get some more serious breezes though as the season goes on. The geese aren't super tame, but fairly used to cars since their favorite fields are near some rural roads. That is as close as I've ever seen them to the road - and while they didn't spook at my car pulling over, they started walking (not flying) away. 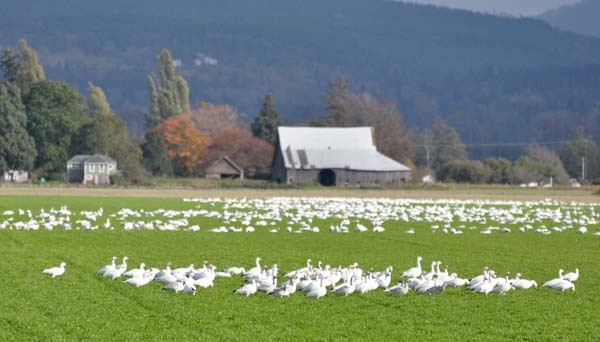 Great sightings and photos of the Snow Geese. It is always neat to see big groups of these geese. On the water 40mph would be pretty rocky! Top gust here recorded by the anometer on the NW corner of our single storey building - 102mph Jan 2006. What's you yaer list up to now? I'm stuck on 183 but hoping to get to 190 if at all possible, 185 should be achievable but the next 5 will be tricky. Could do with that little flock of Snow Geese from last year coming back!